Daughter of Dr. John Jackson (1804-1887), who worked as a physician in Calcutta and his wife Maria Pattle (1818-1982), who was one of the seven Pattle sisters who were famous for their beauty. In 1848 she returned to England with her mother. Her father followed in 1855. The family lived in London where they were visited by the painters Edward Burne-Jones, George Frederic Watts, William Holman Hunt and others. She had become a beauty herself and in 1864 sculptor Thomas Woolner as well as Holman Hunt proposed to her. She refused them and married the lawyer Herbert Duckworth (1833-1870) in 1867. Their marriage was very happy and three children were born before her husband died in 1870, aged only 37. She was so stricken with grief that she even lay on his grave. But her children kept her going. Through her close friend Anne Thackeray she befriended the widower Lesley Stephen, who declared his love to her in 1877. She answered that she never wanted to marry again but early in 1878 she changed her mind and they were married in March. Together they had four more children, among them Virginia Woolf and Vanessa Bell. She also cared for Stephen's daughter Laura from his first marriage. Stella Hills was a daughter from her first marriage. In "To the Lighthouse" by her daughter Virginia Woolf she appears as Mrs. Ramsay. During her life she cared for her children but was also active for many social causes. In 1889 she signed a petition against female suffrage together with her friend Octavia Hill (1838-1912). In 1895 she died unexpectedly of heart failure after suffering a bad influenza. Her marriage with Stephen had also been a happy one and she left him devastated. 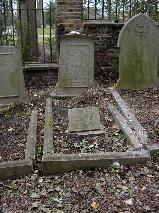 She was buried at Highgate Cemetery East. 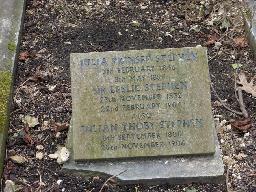 Her daughter Stella Hills died only two years later and was buried in the grave next to her. Leslie Stephen lived until 1904. His ashes were scattered over her grave.